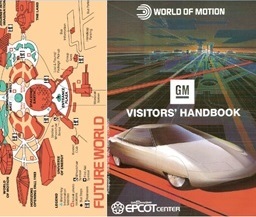 or, I just want to experience the Epcot World of Motion ride one more time! ONE of the most salient factors in the AHMEN (Alabama Honduras Medical Educational Network) adventure experience is the variety of transportation modes you will encounter. Some you are no doubt familiar with, while others are likely to be quite new and unique. Several conveyances you will experience first-hand. Others, you will merely observe. Your journey is a progression that starts as you are gently deposited at the tarmac of the San Pedro Sula International Airport. The wonders of modern air transportation with its cramped seats, questionable amenities, and enlightened companions will be but a fleeting memory in no time at all. Thankfully, customs entry into Honduras is not as unpleasant as American TSA inspired departures. Your first interface with transit will be the amazing luggage cart. After lugging tons of necessities you were sure you couldn’t live without, it is a great relief to plop your belongings on a cart which can be pushed with little effort. Treasure that moment, as you will look back on that simple device as a life-saver. Oh, if only there were flat surfaces augmented by wheeled devices in the jungle! Next, there will be a flurry of activity negotiating rental vehicles. Here, the leaders of the team do a fantastic job in procuring the best available. On the 2016 trip, the rentals were five new Nissan Frontiers – six-speed diesels with lots of power, four-wheel drive, seats for six (in a pinch) and plenty of cargo space in the back. Needless to say, we had lots of cargo— much needed medical supplies for places where there are no competing drug stores across the street from each other. Ponder this story the next time you hop in your car to visit the pharmacy. With the baggage loaded, the trucks ease out into the local traffic. You suddenly realize you are not in Kansas anymore. Not to say that the experience is much different than a cab drive from Kennedy International to downtown Manhattan, but it is still not for the faint of heart. Third World drivers and driving conditions take a bit of getting used to. Sure, there are traffic lights and abundant signage (which, of course, is in Spanish. HINT, Hint! Brush up on your Spanish! ), but it’s not your typical drive around the corner to your favorite Starbucks. To the organized mind, the scene is one of unadulterated chaos. The streets are not only filled with drivers apparently vying for a shot at the Winston NASCAR Cup, but there are also people everywhere. They’re on bicycles, motorbikes, donkeys, walking about willy-nilly, carrying all manner of things, including animals. There are semi-tractor trailers, dump trucks— and buses, let’s not forget buses— you name it and you will see it, including the tiny Datsun pick-up with the twenty-foot high, plastic-wrapped load of disposables to be recycled. And , as if that were not enough, in the midst of it all, there are small children, unbearably close to the roadway where vehicles routinely break the posted speed limit and slur driving etiquette. To be sure, the roads around town are more than adequate and, if it weren’t for all the pedestrians and vehicles, the roads could easily pass for the roadway leading to your neighborhood Club House. You know the place where the pool is. Once your wrap your brain around these conundrums, you will be ready to move on down the line, so to speak. The first preview of bad roads is when the caravan turns off the highway into the road to the resort near Sambo Creek. Don’t get me started on that! 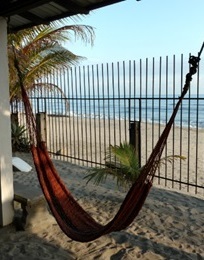 The resort is where you will spend the first few nights of your sojourn. All kidding aside, that brief little road is shockingly bumpy. But savor the moment, as you are still in a paradise somewhat familiar to you. Beautiful white sand beaches, palm trees, warm Gulf waters. If Lady Luck smiles on you as the sun melts into the horizon, you might even spot the herd guy driving his gaggle of cows down the beach at the end of the day. After a night or two of acclimation, off you go to less familiar territory. The long drive on the next travel day is to make sure the caravan gets to the initial river segment with enough daylight to disembark for the first night’s lodging on the river, the Miskito (an indigenous Honduran group) village of Raista, on the Ibans Lagoon. The day’s drive will test your mettle not only as a driver, but also, as many can attest, as a passenger without any control over the outcome. When we pulled out of the resort’s driveway on the recent trip, the highway was in pretty good shape. Most of the potholes had been recently filled by the meticulous road repair folks, who had taken the time to number each of their repairs with bright, spray-painted digits. That made it extremely easy for someone who had been out enjoying the local culture to find their turnoff at Pothole Number 146. As we proceeded east, the road crew was still catching up, but all in all, the highway was in relatively good shape, until we got a short distance beyond Wendy’s at Tocoa. Yes, that’s right. Up to that point, you have an easy selection of just about any American fast-food franchise you could crave, even a few that have ceased operation in the United States. When the pavement gave way to dirt roads, these were initially in very good shape, smooth and wide. In a matter of hours, that began to dissolve as the most aggravating aspect of the road became the topes, aka. speed bumps. This made an otherwise fine driving surface far more unpredictable as the bumps, or trenches, were often not visible until you were right on top of them. Kur-Plunk! To make matters worse, the weather was dry, adding the annoyance of dust to the mix. Lots of dust. As the caravan progressed into the hinterland, the transportation modes encountered began to change. People continued to walk, ride bikes, hitch rides in the back of trucks, or if they had a little money, ride in the three-wheel collectives (often red) which replaced the taxis found in town. Once, we passed a funeral possession followed by a large number of motorcyclists. This was a stark reminder that driving a motor bike on these roads was not only dangerous, but could also have unfortunate consequences. Trucks and motorcycles continued to be seen in great numbers (including one long semi-tractor trailer laid over on its side in a ditch) while beasts of burden and carts, along with horsemen, increased in proportion the farther we traveled. Most of the small rivers and streams that we crossed now have bridges, but a least one stream required a four-wheeled drive of a few hundred feet in three to four-foot flowing water. Everybody was ecstatic about that one. Up the steep bank on the other side the river was a barn and stable for horses. We were able to see the vaqueros, or caballeros, up close. For those of us raised when our pre-adolescent vocational outlooks were limited to spaceman or cowboy (Regrettably, it was a fairly sexist time for our culture. ), this part of the trip was fascinating. The horses seemed relatively small and, sadly, some were undernourished and mistreated. The large majority, however, seemed to be healthy and regarded with proper respect. For those interested in equestrian matters, I’m sure there were some opportunities in the nearby towns to find intriguing gear— saddles, bridles, spurs, et cetera. 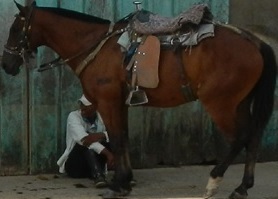 I can imagine few situations more filled with possibilities than bringing a saddle back through customs. As our journey led deeper into the jungle, motorized vehicles and in particular, motorbikes were replaced by horses, as gas stations were harder to find than they are on a remote stretch of the Interstate. But I’m jumping ahead. After the aforementioned stop beyond the river crossing, the dirt road was not well maintained and major potholes became the norm. Careful maneuvering could only take the edge off the nerve-jangling ride. This was especially true when we left the ‘main’ road for a short-cut to the shoreline. When we bounced out on the opposite end, we faced the pristine Gulf of Mexico, which, although we had seen it infrequently, had been running parallel to our trajectory. The dirt track near the beach is muddy and largely impassible when the weather is wet, although the beach itself is firm enough to drive on. Since it was the dry season, driving on the beach was not recommended. But drive on it we did for a short distance, slipping and sliding along in low four-wheel drive least we get embarrassingly stuck. Soon after exiting the beach, we drove through a series of beachside villages, until the road ended in a dusty Garifuna (mixed-race descendants of African and indigenous populations) village. We parked and unloaded the trucks, so we could begin loading three long motorized canoes for the journey along the edge of the lagoon. A crowd of locals gathered and some helped. The longest of the canoes was powered by a thirty-five horsepower outboard motor. It was a little less than forty feet long, but there were enough wooden seats for fifteen passengers and space for cargo. The uncovered boats were constructed of sturdy, reinforced fiberglass. The smallest canoe was loaded to the gills with cargo and powered by a strange concoction of pulleys and belts linked to a gasoline motor. Each canoe had a captain, the driver/manager of the ship. He sat in the back, a bastion of maritime integrity. Each boat also had an assistant, typically a younger male, whose job it was to be at the front guiding, via shouts and hand signals, the transit through the trickier parts of the waterway. When not transporting a large group like ours, these boatmen ran the equivalent of a collective taxi service for people needing water transportation. Even in its narrower sections, the lagoon was wide and easily supported the large collection of rivercraft docked at the banks. Although few boats larger than speedboats were seen, many of the boats were equipped with motors to rival the power of cigarette boats from the Miami Vice era. When we put ashore at Riasta, it would be the last time we would see motorized land vehicles, that is, except for a few motorbikes and the occasional four-wheeler. Most people made their way on land by – foot power. Moving our vast array of supplies was done by hand. None of those convenient luggage carts were to be found, and even if they were, the terrain was far too rugged. After a few days of busy, rewarding (Never underestimate how good it can feel to help someone in need) Medical clinics, seeing sick patients and dispensing medications at Riasta, we were back in the boats for the long, water-bound travel day to Las Marias, deep in jungle. With few roads in the jungle, the river is the most reliable way in. Since the river twists, turns, and has many tributaries, even walking can be more taxing than normal. That is not to say that inhabitants always use the river— many walk great distances to get somewhere— it’s just that when you have access to a waterway and something that floats, it is the preferred means. After leaving the open water of the lagoon, twenty to thirty foot cuts carved out of the mangrove swamp by hardworking, determined workman offered shortcuts to link various parts of the river. River traffic was heavier and more often motorized in this area. Once we reached the Rio Platano proper, the types of watercraft varied in a different way. Although some boats were similar to ours, many were dugouts, pitantes/pipante, which differed greatly in condition, even though the size was fairly uniform. Some appeared newly constructed from a hollowed-out tree, but others looked ancient, scarcely skimming the surface of the river. Some had motors, but often the means of propulsion was a pole, as the river was not too deep. The condition of the boat seemed to have little to do with how much could be loaded on it, as we often saw whole families and lots— I mean, lots— of produce piled in them. Not even livestock was considered unmovable. Thanks God, Ringling Brothers wasn’t disposing excess inventory! As we traveled on the river, many locals were seen walking on the riverside, or coming down to the river, to carry water back up by any means available, whether it be by straining arms, or balanced upon their heads. Parts of the river were muddy but the bottom was gravel and small stones in most areas. Sometimes the river was too shallow for our boat and we would get stuck on the bottom. This required some of our team to get out and push it off. Or, as happened just outside of Las Marias, get out, trudge ashore, then walk the rest of the way to the hotel. When this occurred, we walked twenty-five yards from the riverbank on a strange elevated thru-way too narrow for a car. The ground was hand leveled and had drainage on each side. It obviously took a lot of labor to construct. Another portion of it was later seen on the other side of ‘town’ near the unused airplane landing field. The landing field was rumored to be in poor condition and too short for all but emergency use. There had been a time a few years earlier, before recent political events, when the Las Marias area was building up to become a mecca for eco-tourism. Regrettably, that enthusiasm seems dampened and the positive momentum halted. But the populace endures— tough, tenacious, uncoddled by the conveniences we take for granted. The people of the jungle survive through perseverance, determination and, I have to believe, luck. It is a hard environment to survive in. If there were wheeled vehicles remaining from the period of economic optimism, none were noted during our 2016 visit. In the jungle, narrow paths were the norm and most people simply walked, carrying what needed to be moved. 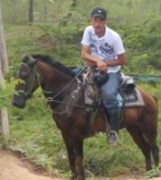 The fastest land mode of transportation was on horseback. Many young men were seen riding about ‘town’, some tending wandering cattle, others transporting small goods. The horses seemed to be a sources of pride to the riders, but even then, some treated their horses poorly, with nasty bits and harsh discipline. Some might say that luck played a part at our last medical clinic when a mother brought in her young daughter for an examination. The twelve year old was in significant distress, vomiting up ten inch worms. (It is possible the infestation was the result of contaminated water.) Our skilled team of medical professionals confirmed the noxious prognosis with the use of a loaned portable ultrasound system. The culprits were spread throughout the girls digestive track. This necessitated the use of one of our canoes as an emergency vehicle to transport the girl and her mother an hour and a half up the lagoon to where we parked our trucks. From there, it was several more hours over the same pitted, rough roads we came in on to get to the nearest hospital. For the girl, it was luck for sure because options such as these were rarely available. From the Wesley Eddy collection, 2016, See more of his fine photography on the AHMEN site. Well, there you have it. These are the transportation options your will find on the path into the jungle. They are but tools with which to help our fellow man achieve a primary but simple objective— providing alternatives to drinking unadulterated river water. So if you are up to the challenge, join and/or support AHMEN’s water filtration project. After all, everyone in the world deserves a safe supply of water, God’s gift to mankind. AND…perhaps you will be lucky enough to have the opportunity to pole up the shallow reaches of the Rio Platano in a shaky pipante to visit the remote indigenous Pech village, and view the mysterious petroglyphs, as you are lured deeper into the jungle by rumors of gold and the lost Ciudad Blanca, the ‘White City of the Monkey God’. All photograph, except as noted Robert C. Frink, 2016. ← #Bizarre #Travel Journal #7: Yule Log??? Have our American parents been giving us the straight Sh** about the holidays??? ?